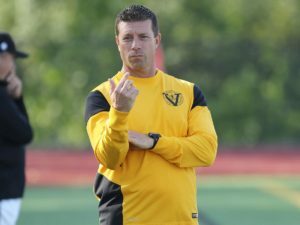 Coach Brian Haddock is in his third year as head coach at St. John Vianney High School and 15th year with the program where he has amassed a record of 40-14-2 in his two years at the helm of the Griffins and a Class 4 State Championship appearance in 2017. Coach Haddock is also the head coach at Nerinx Hall in the spring and in his 12 years as head coach there, his teams have a record of 206-61-10. He carries a United States Soccer Federation National ‘C’ Coaching license and has been named a St. Louis Regional Coach of the Year 3 times. Coach Haddock graduated from St. Louis University High School in 1995 and was taught by legendary coach Ebbie Dunn and played for Charlie Martel. He played club ball for the Busch Soccer Club under coaches Jim Bokern(HOF 2005), Mike Gallo(HOF 2013) Jim Guttmann, John Houska (HOF 2010)and Tom DiMaria (HOF 2015). Lettering in both soccer and baseball, Coach Haddock went on to play both sports at the University of Arkansas-Little Rock and St. Louis University and in 1999 he was named as a Gatorade Academic All-American. He graduated SLU in 2000 with a Bachelor’s Degree in Computer Information Systems and Marketing and a Master’s Degree in Teaching and Administration. Brian and his wife Lori are active members of the Queen of All Saints Parish in Oakville and have two sons, Braydon (10) and Blake (7). Coach Haddock also coaches his two sons in the St. Louis Scott Gallagher Soccer Club and played/acted as an English Soccer player in the 2003 movie The Game of Their Lives filmed in St. Louis. The Jimmy Dunn Award was originated in 1988 by his son, Edward, to honor his father who was Captain of the Ben Miller Team of 1920 which won the National Open Cup Championship. Jimmy scored the winning goal against Fore River Massachusetts, a team of Portuguese Professionals, to win the game 2-1. Edward Dunn started playing Soccer at St. Luke’s parish in Richmond Heights in the late 30’s. He learned the game from his father, the great Jimmy Dunn. During his years at CBC High School and Saint Louis University he played baseball and football. Soccer was not available at this time at these schools. Edward started his coaching career at Saint Louis University High in 1955. He remained there for 38 years, leading the Junior Bills to State titles in 1973 and 1990, and reached the Final 4 many times. He retired after the 1993 season with a record of 592 wins, 197 losses and 104 ties. At that time, he was known as the Coach to have the most wins in the country. Some of the prominent players he coached were Pat McBride and Ty Keough, both All Americans at SLU and Pro Soccer players. Edward received the Msgr. Jimmy Johnston Award in 1986, the CYC Golden Boot Award in 1995 and was inducted into the CBC Hall of Fame, National Soccer Coaches Hall of Fame in 1996 and St. Louis Soccer Hall of Fame in 1994. Edward developed cancer around the year 2000 and he succumbed to the disease on January 10th, 2002. He was 73 years old.